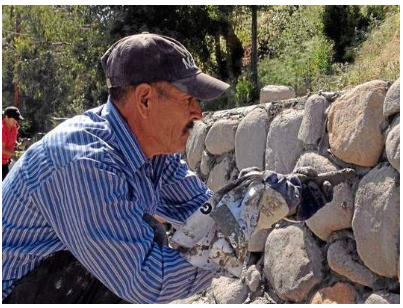 Victor Manuel Salas, a member of the Pomona Economic Opportunity Center, was one of the volunteers who rehabilitated 12 concrete barriers at Ganesha Park at Saturday’s ninth annual Pomona Beautification Day. Hundreds of residents and business people took on scores of projects ranging from collecting trash to doing masonry work as part of Saturday’s ninth annual Pomona Beautification Day. Volunteers completed more than 40 projects before noon, according to organizers. Among the projects was one spearheaded by Councilwoman Debra Martin at Ganesha Park. It involved rehabilitating 12 concrete barriers with river rock. Eighty volunteers, including neighborhood residents, high school and college students, business people and workers from the Pomona Economic Opportunity Center, also known at the Pomona Day Labor Center, carried out the project. “Everyone wanted to do this project,” Martin said. The project was completed with the financial assistance of Fairplex, which provided a total of $50,000 for renovations at the park, Martin said. Close to $9,000 of that donation was used for the river rock project. Among the volunteers were Mario Mejia, 18, a senior at Pomona High School, and Luisa Huerta, 16, a sophomore at Pomona High. The students said the project wasn’t easy. “It’s trying to find all these little pieces” of rock so they fit together, Mejia said. “It’s like a puzzle,” added Luisa. Although the work was hard, they where having fun working and meeting people, the duo said. But there was another benefit. “It feels good helping the community,” Luisa said. For about 11 years the barriers have been in place to stabilize the hillside behind them. Martin said that after she was elected to the council more than two years ago she began asking city staff what steps could be taken leading to removing the barriers and learned they couldn’t be removed without completing expensive studies first. So Martin came up with an idea. “I just saw it as river rock has to be on it,” she said. Ontario resident Victor Manuel Salas volunteered his time Saturday. Salas, a day laborer who secures work with the help of the Day Labor Center, helped guide a group of young people as they cemented the rocks to one barrier. “The city government supports us,” he said in Spanish, adding that now it was time to support the city. Organizers have said Beautification Day is much more than a cleanup project. It’s a community-building effort that brings people together and leads to building relationships that allow Pomonans to work on large community issues down the line. Alejandra Martinez saw just that happen while she worked to paint the picnic gazebo at Philadelphia Park in south Pomona. As people worked ,they began talking about community concerns.